Hi-ho it's Friday- and I am packing for Girl Guide camp- Brownie camp to be specific- not a huge variance between the two only that our girls will be awake all night giggling in cabins rather than tents. Regardless it's pretty much guaranteed that I won't be getting much sleep tonight- it is after all Friday the 13th. So of course with the thought of a long sleepless night ahead of me I am packing up my knitting- because hello sanity! 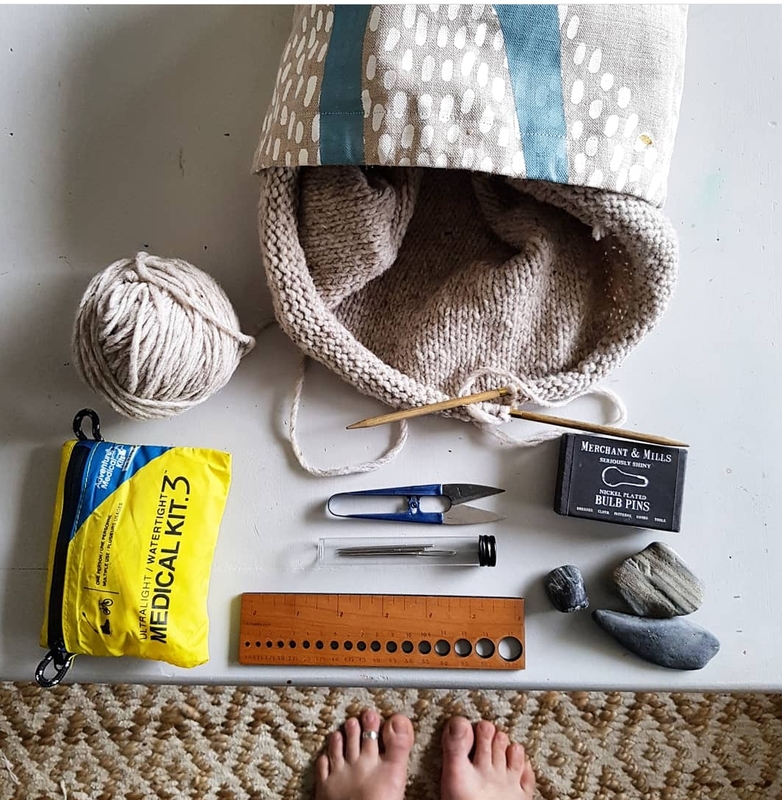 I thought I would share a few of my favourite things that I carry on the reg in my travel knitting bag- because really don't we all want to see what cool stuff our friend's carry around? First off the bag- a few months ago I started turning some of my screen printed fabric into project bags- they are in fact great for a bunch of stuff but of course I use mine primarily for sorting my knitting projects out. I decided to re-open my Etsy shop and am now selling these bags online- you can click here to go take a gander should you feel so inclined! In my bag I have my Freja sweater which was slow going this week- I did not make much progress but that's the nature of knitting- a few stitches at a time was all I could manage to sneak in. There are just so many interesting and useful tools on the market right now and of course everyone has a favourite- I am in love with my Lykke needles which I treated myself to last year- a splurge but worth the investment! I purchased both my needles and my gauge ruler from Fringe Supply- a favourite supplier of inspiration. My little snips I have had forever- like probably fifteen years- they are just that perfect tool that I would be lost with out. I bought the snips and my Merchant and Mills bulb pins at Maiwa on Granville Island- again primary purveyor of inspiration! The tube of tapestry needles for weaving in ends (I'm being optimistic here) was from Knit City last fall- I can't remember which booth I picked those up at- there was just SO much happening! Add to my tools my trusty mini first aide kit from MEC- I usually carry this around with me daily because if a kid isn't getting hurt I usually am! Maybe this is a left over habit from my own Girl Guide days but I always have that handy first aide kit or at least bandages with me at all times! Of course rattling around the bottom of all my bags are treasures from our travels- these gorgeous smooth stones were picked up on a beach in the Kootney's last summer and are just a joy to hold. Adventure is out there my friends and I truly hope you find some this weekend- weather it's taking a moment for yourself to stitch a few rows or climbing up the side of a mountain we all need to take time for ourselves! Myself- my dream for this weekend involves waking up before those giggling girls and sitting with my coffee beside the lake tomorrow morning- even if just for a few minutes before the fun begins! Happy Friday Friends! I'm sitting here at my desk with our backdoor flung open and the cool Spring air streaming in- the sun has not yet shifted around to this part of the yard and I am happy knowing my garlic babies are getting warmed. As my thoughts are turning to longer days spent outside a part of me still knows that Mother Nature could pull a fast one and send flurries any day- today though I will leave the windows and doors open as long as I possibly can. Warmer days surly are ahead and I know my time with wool is fast drawing to a close- in my mind I'm moving on to warm weather projects like t-shirts and shorts- cool linen is calling my name! 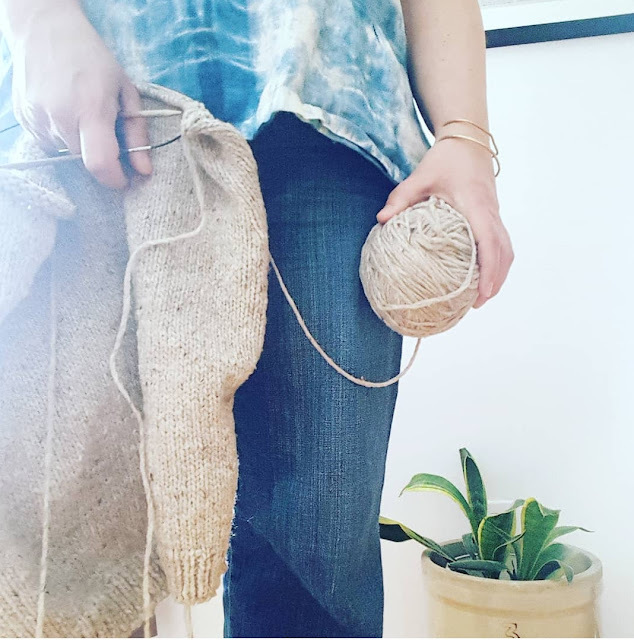 With this in mind I cast on what is possibly my last warm winter knit- and even at that it is a lofty mid sleeve knit which will likely be in constant rotation these cool Spring evenings! The Freja sweater by Brooklyn Tweed has called my name ever since the launch of their latest collection- as soon as I saw Freja I knew I must knit it for myself- my precious! I'm so excited to once again expand my knitting skills- to think that just a few years ago I didn't consider myself a knitter at all! I chose to use Brooklyn Tweed Quarry- which is what the pattern was designed for- I chose the colour Sandstone which is a nice neutral oatmeal colour with flecks of darker browns spun through. 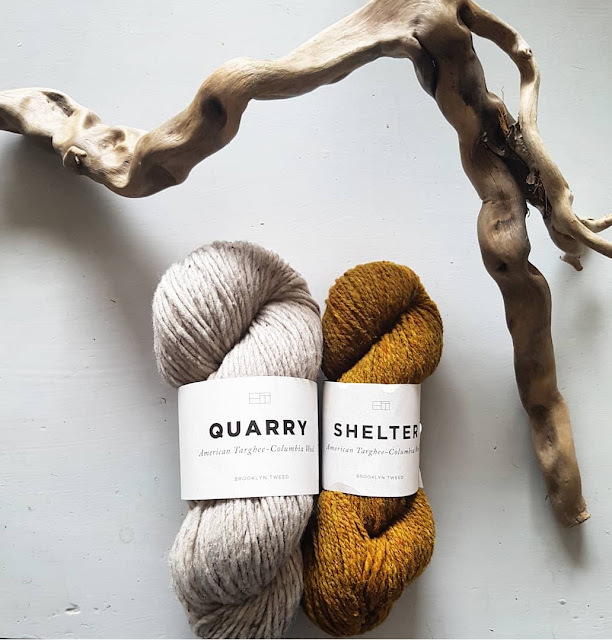 I love working with Brooklyn Tweed yarns- not only are they totally sourced, cleaned, dyed and spun in the U.S. but Quarry has such a magical feel when working with it. To quote directly from the label "Quarry is an airy, chunky-weight wool that mimics the appearance of roving-style "unspun" yarns." To say the least this chunky yarn is a fast and fun knit! I also love that every once in a while I come across a little piece of natural material- reminding me that this wool I'm using is from the earth. One of the reasons I wanted to participate in the 10 x10 Style Challenge- that I posted about last week- is that I really want to examine my own consumerism once again- take a closer look at the materials I am using and ensure I am making choices that align with my heart. Taking a part in this style challenge has opened up a variety of conversations with friends on both sides of the line. On one hand I have so many like minded peers who are interested in slow fashion and on the other hand I live in a small city where $2.00 t-shirts are still considered a bargain. Regardless, one of the topics that seems to come up time and time again is that of both food and fibre security. Not often do we as a society think of fibre the same way we think about food although fast food and fast fashion are akin to one another- and both are equally big health issues. In our valley and indeed in much of our province locality is so popular when it comes to food- slow- local and as organic as possible. The farmer's market scene is bumpin' and we like to support good local food. It's good for the economy and it's good for the earth- it's so easy to achieve a 100 mile diet here in the Okanagan- slow food- grown close to home. Local options for all tastes are to be found in abundance at our farmer's markets or just outside our door in the garden- eating locally grown and seasonal has surpassed fad or trend. Just behind slow, seasonal and local food comes slow, seasonal and local fibre. Now of course this is a niche market at the moment but I know a lot of people are hoping that will change! At one point in time it was not uncommon to look at a clothing label and see "made in the U.S.A"- today there are very few textile mills left in America and we rely on overseas providers for our textiles. As an artist with an interest in textiles where my materials are coming from is just as important to me as where my food is coming from. I want to use fibres from the land I live in. What I look for when choosing my fibres is very similar to how I shop for groceries. I look at the label. I want to know where this fabric or wool is from. Did it travel across the ocean? Or was the wool sourced, cleaned, dyed and spun in North America (like this Brooklyn Tweed pictured above) I want to know what additives have been added to the wool. Is it superwash yarn? This is an important question to me as superwash is often coated with a wash of polymer- yes that is plastic. A label tells you right up front everything you want to know about the providence of the yarn you are considering or dress you want to buy! Obviously cost is a factor- acrylic yarn is so much less expensive because it's easy to make- but it's also plastic. 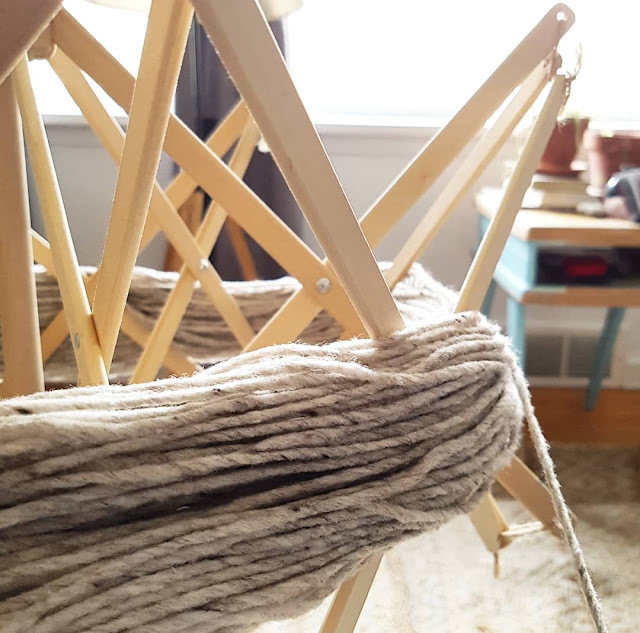 Using wool yarn can be quite pricey- lets face it -knitting is no longer an economy hobby- it has moved into the realm of luxury which can feel limiting for some people. So much like eating organic or local food it's all about balance and budget. Spend a little more and buy a little less for a better quality. I dare say after trying this approach your feelings towards your garments will change- they will become a little more precious- will be cared for differently and there fore last longer. I think just starting to change our collective mindset is an important first step in consuming textiles grown closer to home. Look at that label and support local growers and makers with your dollars. 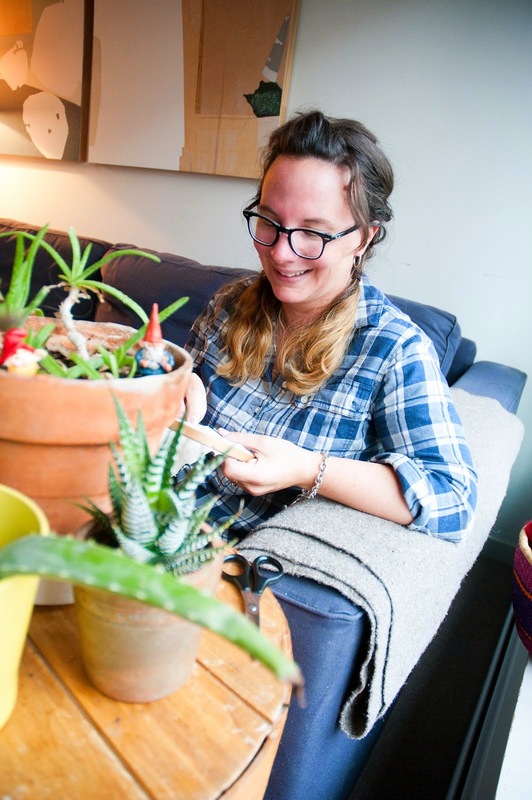 There are so many amazing small scale- local makers everywhere you look these days. Folks who are also interested in where their materials are coming from. By living thoughtfully and taking our time we can make small decisions that have great impact. Moving as slowly and seasonally with what we put on our body as we do with what we put in our body is so important.